« Ricky Gervais Was Mean! Boo hoo! Tsk. It’s so hard to find something decent to buy for our billionaire friends these days. It seems they have everything. And you really want to show them you care. Well, have I got good news for you. You can buy your favorite billionaire a yacht that is basically a minature Monaco, according to Britain’s Daily Mail. The Monaco yacht would have downsized versions of the Monte Carlo Casinos, the Hotel de Paris, La Rescasse and the Loews Hotel. The yacht itself is no miniature. It’s about 500 feet long. The master quarters is about 4,800 square feet, larger than many luxury apartments. 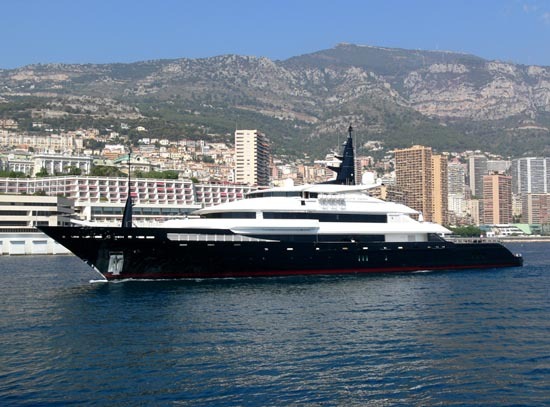 The Monaco yacht can be yours for about 700 million British pounds or a little over a billion U.S. dollars. The yacht is only in its design stages at the moment, but if you act now, you can make sure it’s built. Operators are standing by! This entry was posted on January 18, 2011 at 10:38 pm and is filed under Uncategorized. You can follow any responses to this entry through the RSS 2.0 feed. You can leave a response, or trackback from your own site.